A tale about two sisters, a fox cub, and what happens when one of the sisters disappears forever. Writing in alternate voices—one Jules’s, the other the fox’s—Kathi Appelt and Alison McGhee tell the tale of one small family’s moment of heartbreak. 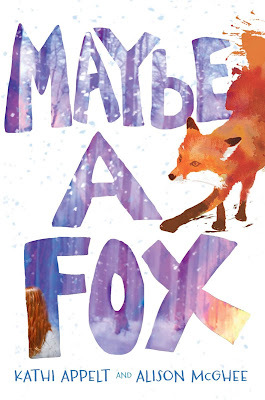 MAYBE A FOX, told in alternating perspectives of a young girl suffering from the loss of her sister and a young fox who was born with a special gift, is a story where bad things happen for no reason to the best of people, and where hope and love rise above all else. From the beginning you know that Sylvie, the girl, and Senna, the fox, worlds will meet, and the ride to that point and the high stakes of that moment were tense at times. In the end, you are left with a beautiful interpretation of the harsh realities of love and loss. Check out the full tour and the list of starred reviews! With permission, here is a snippet from an interview with Appelt and McGhee on how MAYBE A FOX was born. Read the full interview HERE. The collaboration that would become MAYBE A FOX began many years ago in a freezing and dingy dorm at Vermont College of Fine Arts, where we were new both to the faculty and to each other. Alison’s roller bag had gone missing at the airport, and she remembers Kathi tilting her head in sympathy and offering, in that beautiful Texas accent of hers, to lend her a pair of pajamas. Kathi doesn’t remember that, but she does remember breakfast the next day, when the two of us loaded up our trays and scuttled to sit together at a small table between two huge pillars in the drafty dining hall, a table we sat at every day, three times a day, for each of the residencies we shared. It was friend-love at first sight, and it was that very first week, when we were eating one of the many meals we ate together Between the Pillars, that Kathi suggested we write a book together. “What kind of book?” Alison said. “A book about two sisters,” Kathi answered. Both of us had many other projects that occupied us, and the idea was tabled, although one of us would occasionally bring it up over the years. Then, about five years ago, Alison sent out a poem about a small red fox in snow as her Poem of the Week. Something about that little fox ignited both of us, and we decided to take the plunge and begin our book. Giveaway! 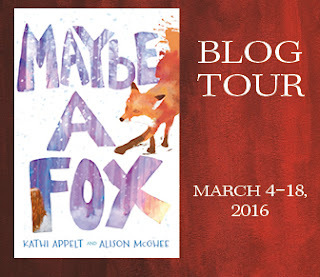 One lucky winner will receive a copy of MAYBE A FOX provided by the publisher. Fill out the fancy do-hickey below to be officially entered. U.S. addresses only, good luck! Kathi Appelt is the New York Times best-selling author of more than forty books for children and young adults. 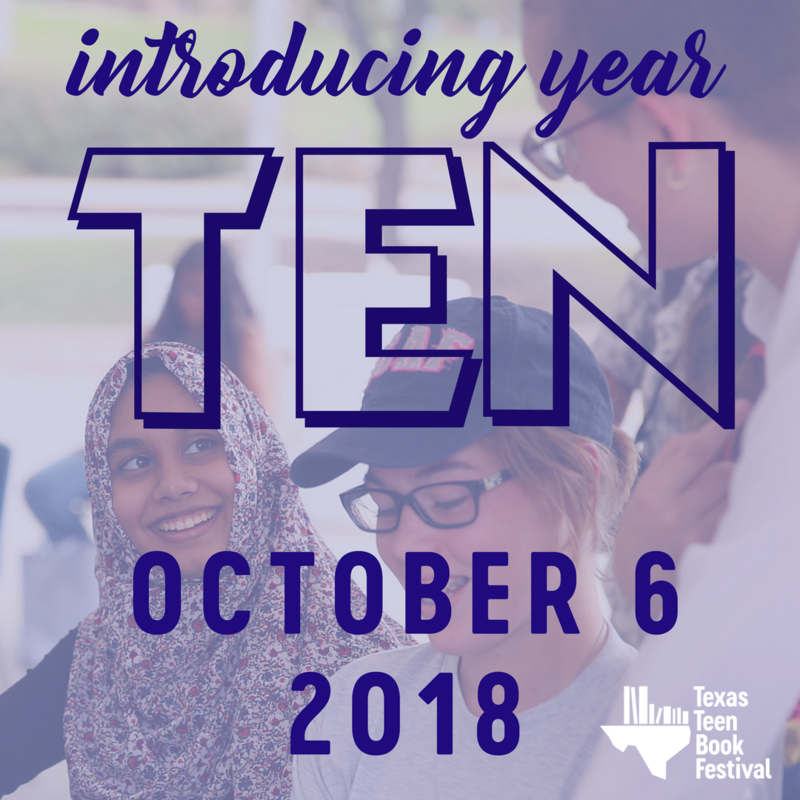 Her novels for older readers include two National Book Award finalists: The True Blue Scouts of Sugar Man Swamp and The Underneath, which was also a Newbery Honor Book. In addition to writing, Ms. Appelt is on the faculty in the Masters of Creative Writing for Children and Young Adults at Vermont College of Fine Arts. She lives in College Station, Texas. Alison McGhee is the New York Times bestselling author of Someday, as well as Firefly Hollow, Little Boy, So Many Days, Bye-Bye Crib, Always, A Very Brave Witch, and the Bink and Gollie books. Alison is also the author of the Pulitzer Prize–nominated adult novel Shadowbaby, which was also a Today show book club selection. She lives in Minneapolis, Minnesota.